Jim River Guide Service ... 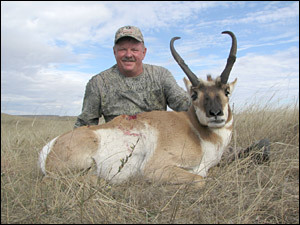 THE best archery antelope hunting in South Dakota. 1. 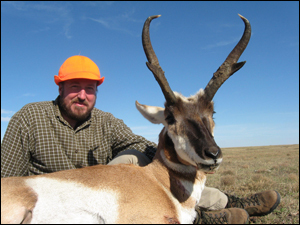 To hunt the highest density of antelope regardless of year-to-year game fluctuations. 2. 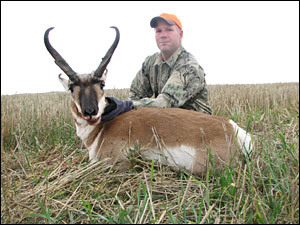 So my hunters can take the great animals from a give area, leaving the mediocre animals to mature and become huge for next season. 3. To avoid bad weather. 4. 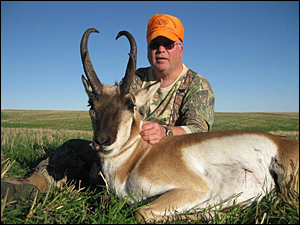 To provide the best outdoor experience to those who invest money and time, and travel half-way across the country to have a great time hunting the South Dakota prairies. 5. 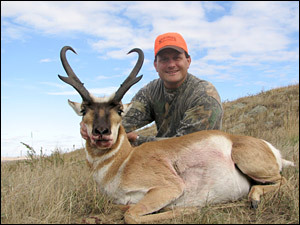 To ensure great success for EACH/ALL of my hunters. 6. 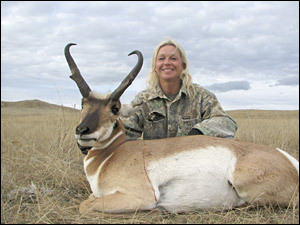 To hunt animals that haven't been harassed by other hunters. 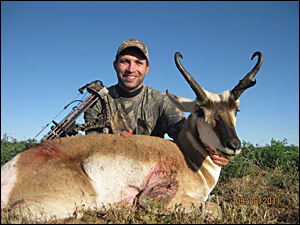 * I am an avid bowhunter and know how to get you close for a good shot. 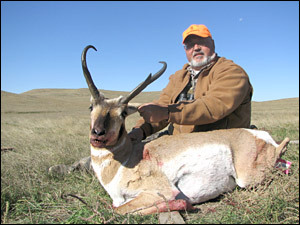 I also offer great hunts for the rifle or pistol shooter. * I cater to small groups of less than 4 hunters. If there are 2 or more in your group, I can guarantee that you will be the only hunters in my camp. 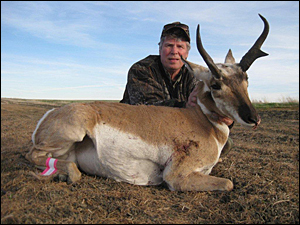 * We will utilize ground blinds, spot and stalk, calling and decoy hunting techniques. * I personally guide you. 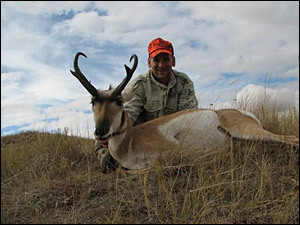 * I run my business in South Dakota and Alaska. 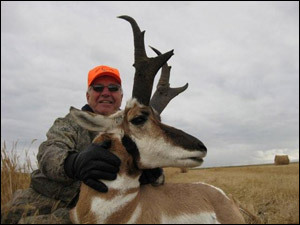 You may have questions about hunting/fishing Alaska that we can discuss while you are here. 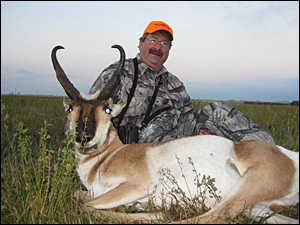 * I have had the honor of having Mike Fifer (CEO of Ruger Firearms), members of the NYPD, a Mayor of Tijuana, and several hunters from the FBI, CIA and The Pentagon, a group of Chicago firefighters, a Top Gun Pilot Wininer, and a lot of "regular Joe's" as clients in the past. I am proud of my operation. 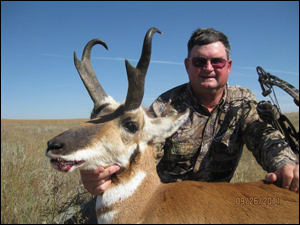 WHEN RESEARCHING A HUNT, YOU SHOULD ASK TO SPEAK TO ALL OF THE CLIENTS WHO HUNTED THE SAME TIME YOU ARE CONSIDERING HUNTING THE PREVIOUS YEAR. 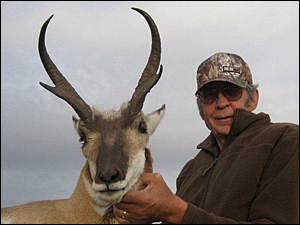 IT IS FOOLISH TO CONSIDER BOOKING A HUNT WITH AN OUTFITTER BEFORE YOU SPEAK WITH HUNTERS WHO HAVE HUNTED THE SAME TIME AND PLACE DURING THE PREVIOUS SEASON. IT IS IMPORTANT TO KNOW AHEAD OF TIME WHAT YOU ARE GETTING FOR YOUR MONEY. 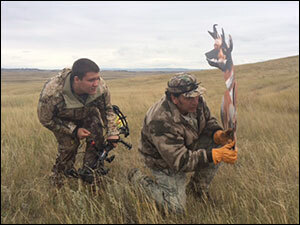 I AM PROUD OF THE ATTENTION I GIVE MY CLIENTS BEFORE, DURING, AND AFTER THE HUNT. 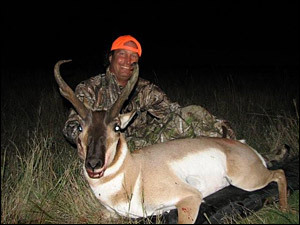 MOST IMPORTANTLY, DON’T CONSIDER BOOKING A HUNT WITH ANYONE THAT IS NOT WILLING TO GIVE YOU THE NAMES AND NUMBERS AND/OR EMAIL ADDRESSES OF “ALL” OF THE CLIENTS FROM THE PREVIOUS SEASON.